Earth awakens from the cold during the month of March in America’s legendary Shenandoah Valley. 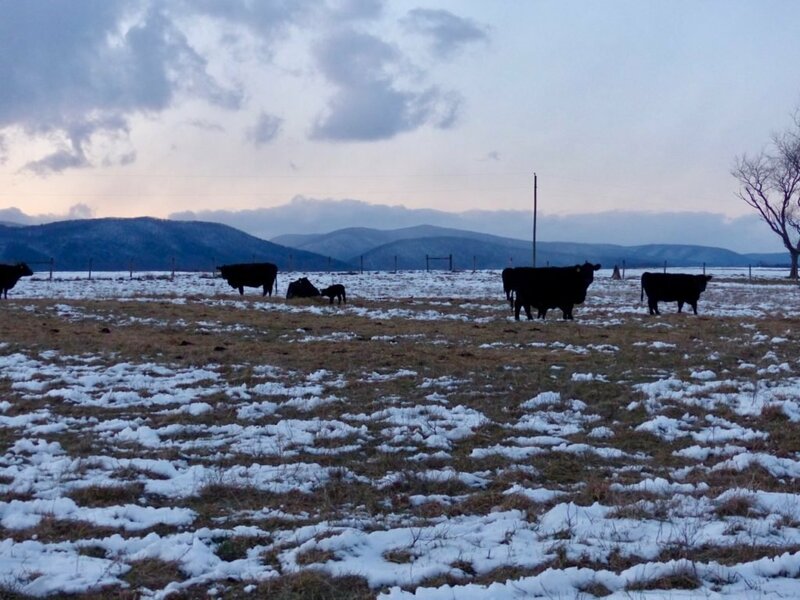 Days lengthen, migrations begin, chloroplasts awaken and absorb the energy from the sun’s photons – photosynthesis begins….pastures slowly turn from brown to green. Life’s energy is on the move. March. The end of winter and the beginning of spring. It usually brings the most severe weather and it’s our busiest month on the farm because we begin calving. One hundred thirty-eight pregnant cows all due to give birth in the next ninety days. Red-wing Blackbirds arrived in Swoope at the end of February and that, for me, signals the beginning of the great avian migration. Each day I look for a new arrival. A Fox Sparrow one day, Hooded Mergansers and Buffleheads another, an Osprey. Killdeers amass. Bluebirds start looking into the nest boxes we put up for them and other cavity nesters. Each day we feed the cows we check a nearby pond for migrating birds. Eagles nest nearby. One day as we drove slowly across the dam I scanned the far end of the pond and “Oh my God,” there were several Sandhill Cranes. This is very rare for Swoope. They are on their way to breed in Canada above the Arctic Circle. 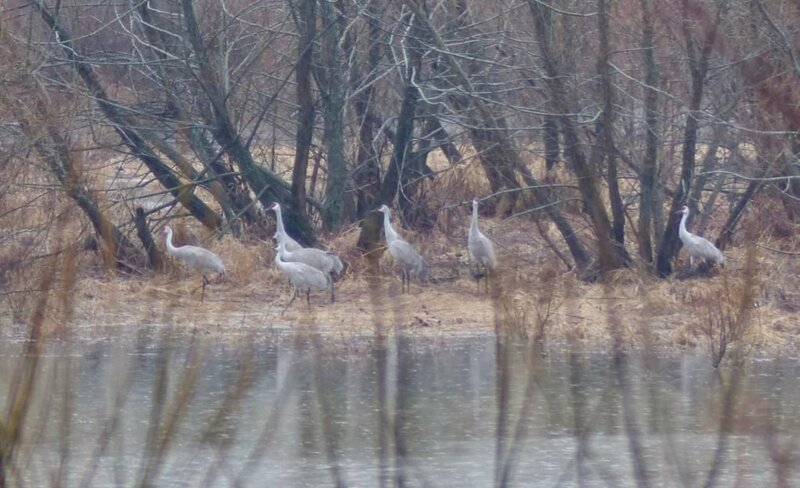 Sandhill Cranes in Swoope. Photo by R. Whitescarver. We get up before dawn. Our waking thoughts are outside, wondering if anyone calved during the night’s cold and wind and if the cows were good mothers. Good mothers lick their babies dry to keep them warm and present their udders in a calm way so that the babies find the nourishing teat that will keep them alive. This day would turn out to be the most dramatic day, so far this calving season. We tagged* three calves before nine am. Everything looked normal. Everyone is alive and well. The calves run and jump around. I love it when they “kangaroo jump” around their mothers. I see a calf take off running like a deer, his mother chasing after him. At about 10, cow #X12 had a baby and it never got up. We think it was breech. We took it to Westwood Animal Hospital. Dr. CJ, one of our veterinarians came out to the jeep where the newborn laid. She opened his mouth to look at his gums. We carried the calf into the small animal hospital and laid him on a stainless steel table. They put a little cup over his nose to administer oxygen, then lowered him into a warm bath. CJ took his temperature. Ninety-one degrees. “I’ve never brought one back to life from a temperature lower than ninety-four,” she said. After they got him stabilized they put him in a heated stall and waited for a miracle. Jeanne and I returned to the farm to check for new babies and to haul hay out of one the barns. The #X12 calf didn’t make it. We grafted** a twin calf from a nearby farm onto the #X12 cow. Eight more babies were born on this day including the #Y4X6 calf. The mother didn’t claim her baby so we took him into the barn and placed him in the calf warmer for the night. 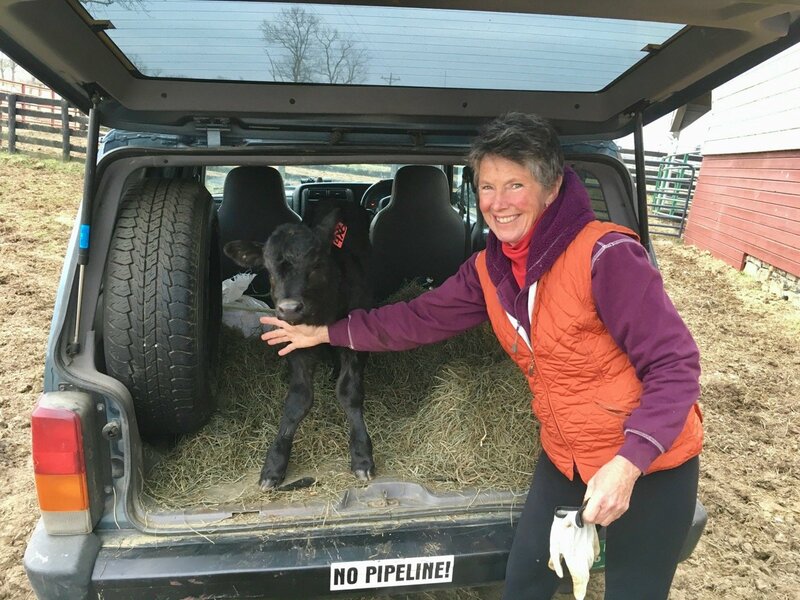 Jeanne with the #Y4X6 calf warm and ready to go back to its mother. The snow started just before daybreak. The forecast was for 2 to 4 inches, it turned out to be 8. Two calves were born this day: #509 and #61. The 509 cow and calf did great. 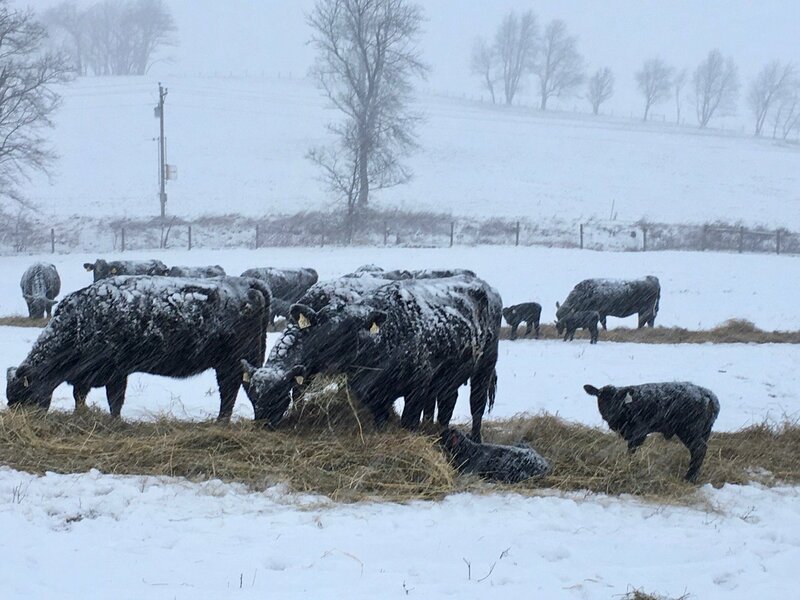 This is when you say, “wow, I can’t believe they can do this.” Eight inches of blowing, white-out, snow and the baby is warm and tucked into the hay. A good mother and a strong calf is a winning combination. Heifer #61 didn’t do so well. She just didn’t lick the baby dry and the baby got cold. I picked him up and carried him to the back of the jeep and with him on my lap, Jeanne drove toward the barn. Jeanne made the sounds of a pitiful calf and the mother followed us all the way to the barn. We put the calf in the “cooker”*** and the cow in a nearby stall. After the baby got warm, we put the two together in a stall to bond. The mother made good sounds with her baby and licked him. 74 cows have calved, two sets of twins (one DOA), two calf deaths (one at Westwood, one froze), 64 to go. We had to get cow #115 into the barn. She had twins and the babies just weren’t getting enough milk. But she’s got this huge udder. While checking for newborns, we stole one twin, put him in the Jeep and drove him to the barn. Next, we put a halter on the remaining twin and put him on my lap in the Jeep. Hopefully, the mother would follow us for half a mile through five fields to the barn. By making a sick calf sound and with patience we all arrived at the barn. After she settled down a bit we put her in the head catch to investigate her udder. Her starboard teats were fine but her port side was the problem. The front teat was nothing but blood (mastitis) and the hind teat was empty. Jeanne milked out the infected quarter and administered antibiotics into the teat. We let the twins nurse her starboard side down and then we supplemented them with a half bottle each of milk replacer. I went to the river field to clean out a few nest boxes in the North tributary. Finally! Tree Swallows. I’ve been waiting for them for weeks. Last year they arrived on February 24th. Tree Swallows nest on our farm at the river. The males usually arrive about the same time daffodils bloom. Photo by R. Whitescarver. When they get here, it’s the first day of Spring for me. They came from Florida and Cuba to nest here. Calf #65 in Wheatlands is lethargic. Has a fever. Swoope in winter. Newborn calves in the foreground. Buffalo Gap in the background. Photo by R. Whitescarver. * Footnote 1. Tagging a calf: Catching the newborn, administering two shots of vitamins, banding (a form of castration) any bull calves, iodine the navel and putting a tag in the left ear with the same number as the mother. **Footnote 2. Grafted: The act of making a cow think another calf is hers. This is done by skinning the dead calf and attaching the skin to a live calf. Cows have a tremendous sense of smell. We usually administer a sedative to the cow and then present the cloaked calf. *** Footnote 3. “The Cooker”: A calf warmer. It looks like a large lunchbox. It has a cabin heater in it. We use it to put hypothermic calves in to warm them up. Welcome to Spring! We are expecting several inches of snow today and tomorrow. It is always good to here about your activities on the farm. Thanks for sharing. How do you snd Jeanne decide which calves to keep? Or do you keep any? Do you guys retire your old girls that can’t calve anymore and let them live out their days there or do you take them to sale? I love the pictures…. Nikon or Cannon? Sorry about the 20 questions thing! Thanks for your comment, George. We keep the “best” female calves to replace cows we no longer want. We sell most of the undesirable cows. 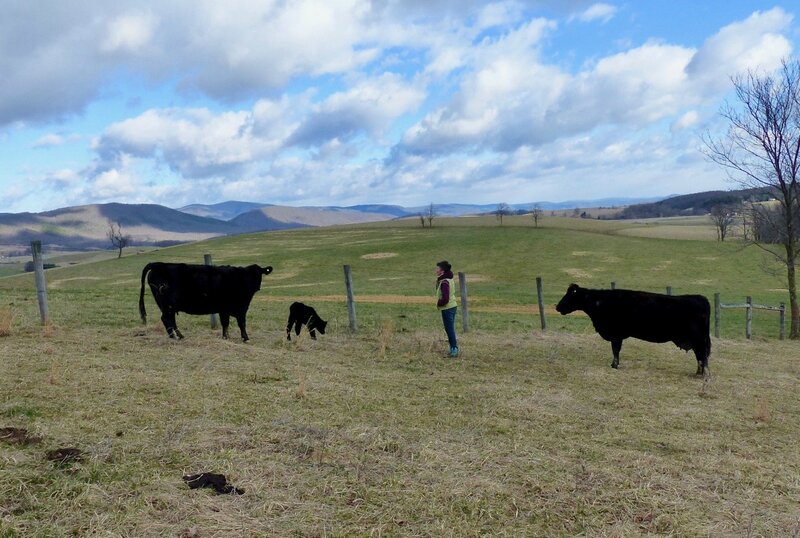 We try to cull about 15 to 20 percent of the cows each year and bring in about that many heifers to replace them. A really special cow like cow #1 we let them live out their days here and bury them on the farm. My cool camera is a Panasonic Z2000. Thanks, Dusty. You should stop by sometime. Very good reading. Hard, but very rewarding work I’m sure. Thanks for your comment, Roger. Yes, it’s very rewarding. Bobby, you help us understand that while calving is a natural event, sometimes Nature needs a helping hand. Great post, great job assisting Nature! Thank you, David. Good to hear from you. Thats cool about the cranes. Life seems really good there in Swoope!! Thank you, Keith. Hope you are doing great. Thanks for the reports, Bobby. They mean much more than you know! Good luck with the late snows tonight. Thanks, Breck! Did anything ever come from the Montpelier Design Congress? Such an interesting and heart-warming post! Your thoughtful words mean a lot to someone like me who has downsized from farm life in Loudoun to suburbia in Richmond. Keep them coming. Have you, Jeannie and the rest of the expectant mothers in our thoughts as the snow moves in. We prepped a lot yesterday. Two calves born this morning in the cold rain but doing fine. Hope we do not get much snow. Fingers crossed. Thanks for your support. Thanks, Anne. The Cranes didn’t even stay a whole day. I was very lucky to have my camera when we checked. 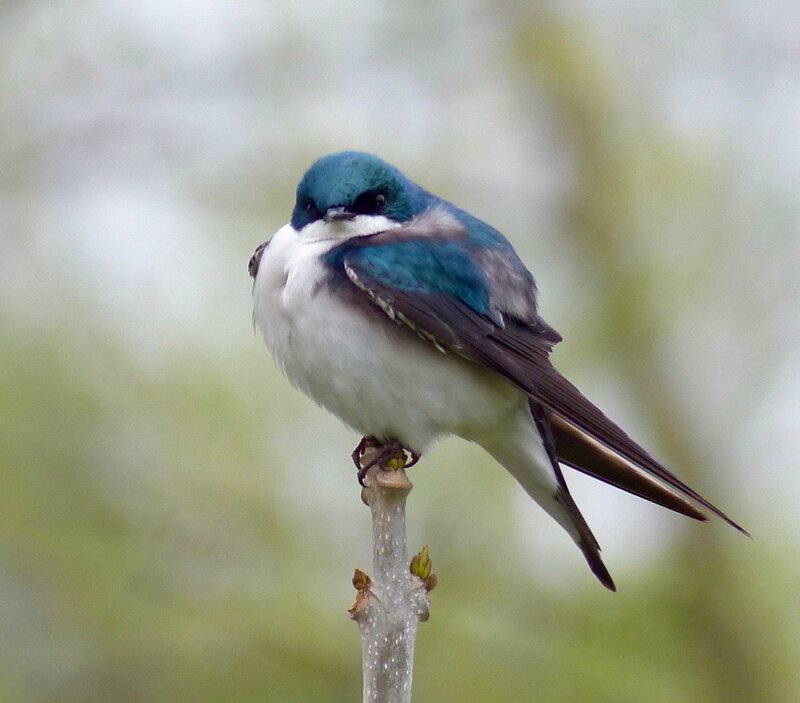 Tree swallows are such beautiful birds…they surely are a signal of spring! They sure are. Thanks for stopping in Nick. Hope you are doing great. All of your posts are so wonderful – educational, enlightening, inspiring. This one particularly so – I so, so admire all the miraculous efforts of both you and Jeanne. And the photos – that add such life to your words – are amazing. Happy, happy spring to you both. Thanks, Kelly. Hope to see you soon. Thanks for your kind words. As always, your stories captivate me! Thank you so much for sharing your knowledge and experiences – my world grows larger. Charlotte, thanks for your kind words and for posting your comment. Bobby, Would you have noted the date when you saw the Osprey? Penny, thanks for your kind words. Yes, I saw the Osprey in a large tree overlooking the Smith pond on March 10th. The animals (both wild and domestic) on your farm are lucky to be there with two such caring stewards. No wonder the Sandhill Cranes decided to make a stop there.. They somehow knew! I so appreciate having a glimpse into your amazing world! Your photos are fantastic, and your work is admirable in every way. I had no idea that sandhill cranes might migrate through here; I’ve only seen them in Wyoming. I’ll send you some images of the migratory European White Stork that we saw plenty of in Morocco. Barbara, thank you for your kind words. Morocco sounds wonderful. Please send the pics of the E. W. Stork. What a treat for this suburbanite to learn about life on your farm. Joan, thanks for stopping in and posting your comment. This is a very interesting post and I can see the hard work that March brings. It is very cool how many various species of birds that visit your farm. The information you provide about where they are from and where they are headed is very informative.